Siteground offers hosting services like reseller hosting, cloud hosting, dedicated server, and web hosting. Extra services delivered like Email hosting, FTP hosting, PHP hosting, cPanel hosting, and MySQL hosting. It bestows with Joomla templates, Magneto themes, student hosting, speed technologies, and security solutions. Latest technologies embedded with the company are NGINX web server technology, SSD drives and super cached that allow users to optimize their websites via Google page speed. To make a website fast a CDN service provided, PHP7 is available for faster PHP and HTTP/2 is available for faster loading. SiteGround, a beacon of light for web hosting since 2004. Since the launch of the company in 2004, it has brought an element of change and innovation into web hosting. The company’s vision is being guided by the able hands of its CEO, Tenko Nikolov whose expertise, skill and commitment aligns with that of the founder of SiteGround, Ivo Tzenov. Currently, SiteGround hosts over 500,000 domains helping several startups and individuals get the boost they need in being successful. Success has always been associated with SiteGround from the get-go. Not relying on only its past laurels, SiteGround promises to get even better and better. SiteGround offers a decent price range that makes it not only one of the best, but also one of the cheapest and popular hosting type for small businesses and startups. During the establishment of the company, one of the goals of the company was to ensure that everyone was given a chance to thrive. SiteGround offers several attractive and customer friendly plans that would certainly interest a simple user. In the area of Shared Hosting, SiteGround is a head taller than all its peers. In fact, there is no competing with SiteGround in the area of Shared Hosting. Knowing that most of small startups and businesses find it hard to get their own dedicated hosting, SiteGround in its foresight and wisdom then developed one of the best shared hosting system possible. A fixed amount of disk space designed to keep you conscious of the space you have to work with. SiteGround makes no empty promises of unlimited disk space – it is unfeasible and SiteGround would never play on your intelligence. SiteGround provides self-help materials that make it even easier to use and navigate through. There are several friendly plans that are offered to clients to ensure they get their money’s worth. Each of these plans comes with its own particular benefit, designed for a various customers. When the emphasis is on continued web surfing, the GoGeek plan is just the one for you. It was designed for web wizards and web enthusiasts, basically the real web geeks (SiteGround may place special emphasis on simple users, but it doesn’t neglect the web geeks). SiteGround offers a wide variety of website builders and platforms that make them even more attractive. Platforms such as WordPress, Joomla, Magneto, PrestaShop, Drupal, WooCommerce are available on SiteGround allowing you to have a wide range of choices to pick from. All these application hosting services offer some degree of advantage over others – SiteGround is well aware of this fact and this is why so many options are made available. For example, SiteGround offers a Managed WordPress Hosting option that is even available in a number of packages, allowing you to pick the one that best suits your need. The idea behind the managed WordPress service is to make as powerful as possible but still simple and easy to use (Remember, SiteGround prioritizes its simple users). As far as credibility goes, SiteGround is recognized and recommended by WordPress.org. It doesn’t get any better than that! Here are a number of WordPress packages that you can choose from. The most important after the launch of a WordPress hosted site is to grow it, o make it as big as possible. For this exact purpose, GrowBig is just the package you need. And of course, those juicy Geeky WordPress features are available. SiteGround offers a Joomla Tutorial that gets you familiar with all you need to know when using their hosting service. The idea is to equip users with as much information as possible. A Magento Tutorial is also offered that teaches you the basic knowledge of operating a Magneto hosted website. SiteGround offers a WooCommerce Ebook that is all encompassing of the dimensions of the hosting service. There is no denying the importance of this ebook. Evidence of this is seen in the glowing reviews by users on its usefulness. SiteGround relieves you of all the stress of management, making you free to focus on more important day-to-day running of your website. SiteGround offers a fast WordPress Launch which is automated to a speedy and functional installation. WordPress Transfer is free on SiteGround including on professional packages like GrowBig plans and GoGeek plans. Daily security and automatic update allows you stay functional, operational and up-to-date. You can create unlimited number of email accounts that comes with free SpamExperts service. You would also enjoy the webmail interface included in the SiteGround email offer. Secure and sure – SiteGround offers daily backup of up to 30 copies. On SiteGround platform, enjoy top-rated WordPress customer service and support with a customer care team that is ready at all times. The team is highly skilled to handle any of the problems you encounter. Available by phone, chat and/or ticket, you get the online support you need. One thing you can count is their eagerness to help you at any time. fast ssd drives and php7..
I`ve been a very happy customer of SiteGround for a year now, but when going to renew my plan, I was shocked with the bill: it was double what I was expecting, and what I paid initially. I called up the customer service (which was traditionally good), and was pushed around and spoken to rudely. They absolutely refused to give me to any supervisors whom, despite "being in the building", "do not speak over the phone." In addition, the rep lied about why they offer the prices they do, changing explanations throughout the course of the phone call, and ultimately hanging up on me. While SiteGround appears to be a premium service with great rates, their performance is only above average (not premium), they are deceiving about their pricing, and are unwilling to help when it`s really needed. SiteGround is going to start summer sale which will be launched on Friday, July 3rd, 2015. company will be providing web hosting $2.95/mo for US customers. This sale will be valid on Monday, July 6th, 2015. I like Siteground, but it seems to me like the rest of these reviews are fake. The reviewer names are very plain American sounding names, but the grammar is very poor throughout. Probably written by the website owners. This review probably won`t get published. SiteGround has partnered with Joomla for new service Joomla.com to run the project. Company has created the server infrastructure for accommodating free Joomla site. The new service will eliminate the hosting cost of setting up websites and easy to start. SiteGround has launched promotions offered to first year hosting the Upgrade to higher hosting package. Discount offers are applied on shared hosting. Package StartUp fell 60% to 50% for 2 packages GrowBig / GoGeek. 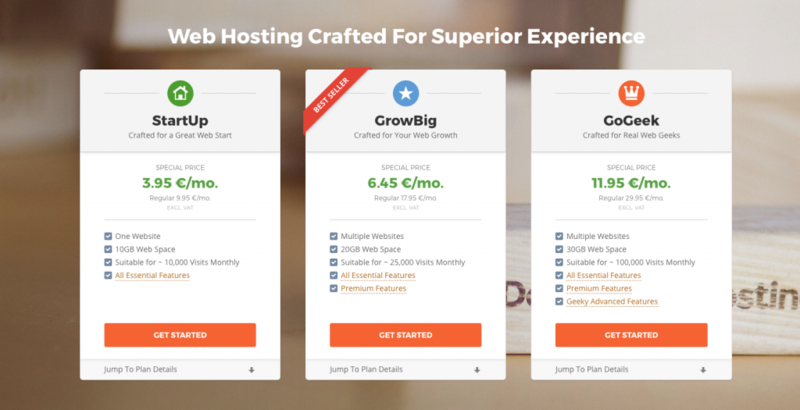 When we upgrade package to package GrowBig StartUp will be added free hosting for 12 months (save $ 59.4) upgrade package will be awarded GrowBig up GoGeek hosting 3 months (save $ 44.85). SiteGround has launched its new chat with great improvement. New chatting option is easier and personal for their customers. Clients can check the operator profile. It is mobile friendly so customers can chat with company operator through mobile interface. The new chat is using Extensible Messaging and Presence Protocol (XMPP) which makes the exchange of messages and faster. It includes inbuilt tools to speed up the action of the operator. By this facility operator can execute client-site checks and email service. Its contain chat distribution system among operators. Now the operators can receive efficient resource allocation, better quality of chats and faster servicing of the client. SiteGround is good option for those customer who want website for their business. SiteGround is offering $9.95 per month with a one year agreement which is good for those customers who are trying to get into the web hosting services. SiteGround offers shared Web Hosting package in $24.95 for one-month trial with one-time setup. cPanel offered by the Site ground is just good..Other features are also good but cPanel is best. If you are looking for a cPanel for your web site, then you must go for Site ground as it will definitely offer you 100 percent result. I am using this web hosting provider to serve my web hosting needs. I am happy with this, as it did well for a very long period. Their services were also worked well but suddenly something went wrong in their customer service. Actually problem arises with the language..Language problem..Now customer care rep live in different state so their language is totally different, they do not understand my language so I cannot make them understand my problem in a better way as I done earlier. As my problem was simple so, spammers were allowed by them on their system due to which my e-mails were getting constantly blacklisted, and thus not even a single spam sent by me. I would like to appreciate the services of Siteground...they are good, especially their customer service. Their staffs is technically well qualified and experienced so if you face any kind of technical problem in your web site, then their technical expertise are there for your support. It is required also as people do not know so much about technology, they do not understand technical terms, terminology so staff with technical knowledge is required at foremost level. And the company is having this kind of staff, so no need to worry about anything. Whenever I face any kind of problem, their expertise helped me a lot. And finally my problem also gets resolved. I was using the services of this company from last 4 years and whenever I need their assistance; their customer care rep was always there for my support. They talk to me very politely, listen my problem with patience, guide me step by step and resolve my problem on instant basis. They are also trained very well especially in the technical field, so we can call them technical expertise also. All the staff members are very helpful as people do not understand technical terms and terminology, they do not have knowledge of technology also, so they always need technical help. Another good thing is that these reps are reliable; this is required as people do not have knowledge so whatever steps are guided by them, and people follow them with blind eyes. They also gave you some ideas which can improve your problem. It allows you to feel safe and confident...Good work. Site ground offers excellent features through their web hosting plans.Their features are excellent; their services are also excellent... Highly recommended by me. Its a good web hosting provider..Keep up the good work. After this, I have decided for a new web hosting service. I opt for Site ground which ranked good among the several web hosting providers, its prices were good and whatever I required in the terms of web hosting features all offered by them. Their customer service is also good. I got more than my old host and the good thing is that all at the same price only. So, I have decided that I switched to Site ground.. The customer care rep of the company were well qualified, talented and experienced, they have a huge database of information, they were knowledgeable, friendly and extremely helpful in making the transition to their company and system. This was the situation few years ago, and then I face very few problems but still they are with me in a very friendly manner and always helpful in solving the problems. I host three domains through Site ground and I trust this web site. I renewed my hosting service and renewed two of my domains for next year.